Despite the threat of impending rain, I took off this morning to go to some yard sales. There were a few bummers where the promised yard sale didn’t exist because people didn’t drag their stuff into the yard due to the weather, and I had to navigate a few cramped garages, but it was worth it. I wasn’t very far into the day before I saw a stack of wood shelves and the standards for them on a guy’s driveway. I cruised past and into the garage, but on the way out, I stopped to look at them. There was a 4 written on tape on the side of one standard, so I was wondering if that was the price. I was trying to size up the situation when the owner came over. He informed me that what I was seeing wasn’t all I’d be getting. He had the standards, eight 4 foot shelves, and four 3 foot shelves. The 3 and 4 foot shelves can’t be used together since there is only one set of standards, but basically, the package included 12 shelves that could be made into two sizes. I was starting to think that 4 on the side of the shelves was too good to be true as a price tag. All the wood was in great shape. Plus, check out how close the holes were drilled in the standards. 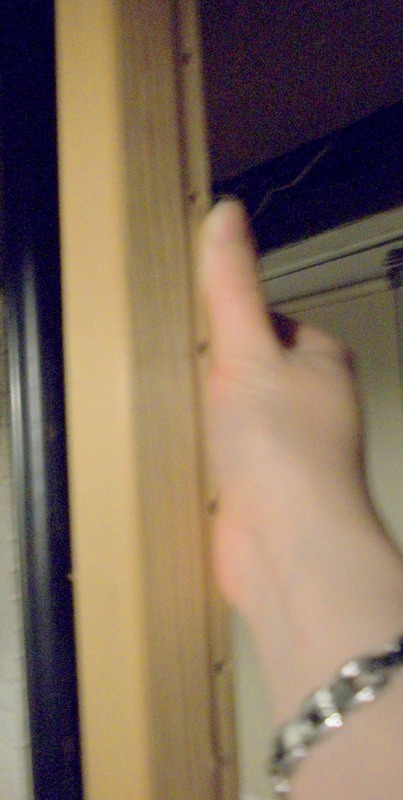 Sorry, I was taking the picture with one hand and using my thumb for reference, but I think the picture is clear enough to convey the idea that the holes are super close together the entire length of the shelves. Everything is lined up so beautifully too. I’m guessing that the guy made them and that he really knew what he was doing. I had been standing there wondering if I should insult him by asking if the 4 on the tape was the price, and he actually said I could have everything for $5. He didn’t have to tell me twice. I whipped out money and paid him before anyone else could overhear and try to get in on the deal. I was so excited that I carried the shelves to the basement and partially assembled them (which was a bit tricky for one lone person to accomplish). 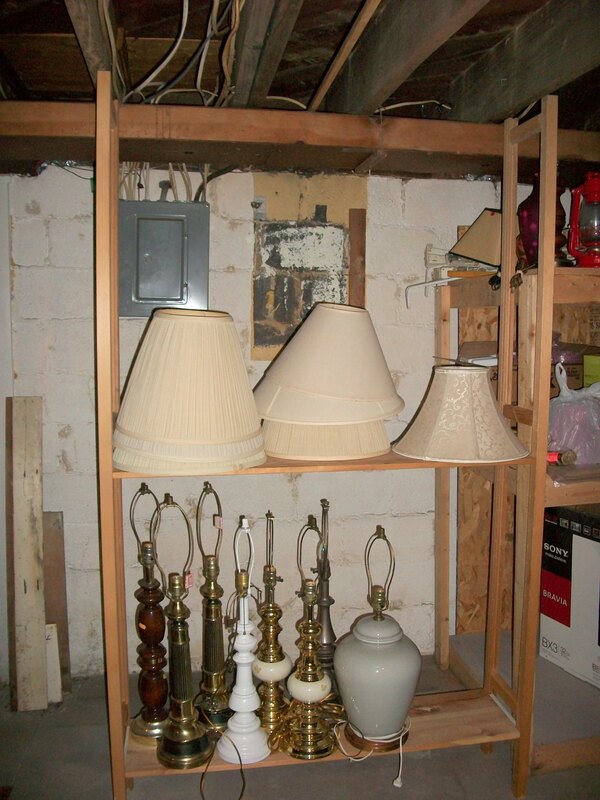 I have a bunch of lamps that I want to refinish, so I started arranging them on the shelves. Now, I can actually get to the peg board that holds my tools, which means I can actually make progress cleaning the basement. Yes, this was $5 well invested. And, when I went downstairs to take this picture with the most horrific backdrop ever, I realized that if I take the harps off the tall lamps, I can actually drop the shelf and add one or two shelves beyond what I thought I could add. Go, yard sales! May the basement cleaning momentum continue. This entry was posted in home improvement, that's life, Uncategorized and tagged organization, yard sales. Bookmark the permalink.